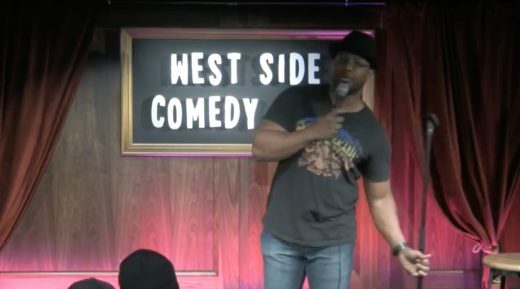 We met up with upcoming comedian Ibrahim Khalif at the new Upper West Side Comedy Club right after his show. I had a tough job working as a Black Man and Muslim in post 9/11 America. Long hours with very little upward mobility. I should be collecting Social Security ya know? You think I have grounds for a claim? I didn’t. It was always said to me, “you should be a comedian” when I was younger, but I held the art form in such high regard I never thought I could do it. My sister told me my sense of humor was different and I should go on stage. I went on stage when I was 11 and got a standing ovation but never got on stage again until after my mother passed away. I was using comedy as a coping mechanism and found it cathartic. Probably annoying someone on a train, bus, or supermarket check out line. Or possibly at home fighting my cat. Anywhere I can get stage time honestly. I like to perform at the WCW show at Essence Bar in Brooklyn Wednesday’s. The show is hosted by Meme Simpson and Kelly Kellz. The energy is unlike anywhere else and it’s a great place to cut your teeth. The crowd isn’t easy but they are very savvy. They don’t allow any easy wins. There’s another notoriously tough room in Brooklyn called Footprints Caribbean Cafe hosted by the OG, Freddie Ricks. This place I like to call a bomb shelter. It seems the entire Caribbean unites in a consorted effort not to laugh at your jokes. But if you can get a few of them then you’re lit. I go there if I wanna really get my soul calloused and skin thickening. I also love to perform at West Side Comedy Club New York Comedy Club, and EastVille when given the chance. The Grisly Pear can be dope too, but Essence Bar gives my material the conditioning to workout in the other clubs and shows around the city and everywhere else. It also depends on the show. Beauty Bar also has a great show hosted by Josh Carter on Fridays and Bryan Yang On Tuesday’s. Just outside the city Lonnie Bray and Bryan Villone run a great show at the JC Underground on Wednesdays and Saturday’s in Jersey City. Talent Harris, from Def Jam, has a great packed out show at the Stress Factory in Jersey the last Sunday of every month. The DMV area also shows the kid love. Boston Comedy Festival a month ago. Great comedy towns. The funniest comic out there is my friend and mentor Gordon Baker-Bone. Hilarious. Just put out an album, headlined Caroline’s and he definitely should have a Netflix special and performing at the Comedy Cellar. Plus, he’s from my hometown of Newark, NJ. He destroys everywhere he goes. A lot of the well up and comers are in and from Jersey. New Jersey is an untapped well of talent. Danish Maqbool, Franco Danger, Amy Colon, Alex Nicholas, Meme Simpson, Rey Gibbs, Cee Jay Craxx (he just did the Apollo) and Zach Pickert. A few in NYC are Jared Waters, Fen G, Eagle Witt, Neruda Williams, Alex Starr Kandyce August, Rallo Boykins, Adrienne Iapalucci, Reggie Edwards, and Stephon Hightower. When I made a room full of Trump supporters laugh at Donald Trump and Bush Jokes. There was a contingent of white-haired men sitting to my right at a club in Atlantic City. I called them the 12 Angry Men. After every punchline I heard them say to one another “that was pretty good….that was hilarious.” Then when I concluded the bit with my Hillary joke I got an applause break. One of my first. I think it’s my responsibility as a comic to be in the middle and make fun of both sides, and they appreciated it. I perform at least 6 times per week. Being a Jersey Comic I’m still trying to break into the NYC Comedy scene. So opportunities within the city are sparse but when I get them I work my hardest to leave my mark. If hecklers wanna be part of the show I’ll make them part of the show, but it’s only gonna be fun for the rest of us. Some of the places I go and do comedy are not ideal so it makes me more adept to deal with hecklers. Listen to everyone when they’re telling you to do stand up! You definitely can do it. And Snoop Dogg was right. Don’t love these hoes. The women are dope but these hoes ain’t loyal. Know the difference. My main comedic influence growing up is my mother. Tujuana Boyer (R.I.P.) she was one of the funniest humans I ever have known. And I’m not just saying that cause she’s my mother. She had timing and was honest. Sometimes too honest. And that’s my brand of comedy. My honest thoughts. Comedians who influenced me growing up were George Carlin, Richard Pryor, Billy Crystal, Michael Colyar, and Johnnie Carson. It’s like throwing a grenade and ain’t no BOOM. I guess that’s why they call it Bombing??‍♂️. I’ve always had a keen eye for irony. I think irony and honesty makes the best comedy. I love pointing out hypocrisy. I see jokes as a puzzle of seemingly unrelated events. Yea. Call New York Comedy Club and West Side Comedy Club and tell’em to pass me already. I’m joking, but dead serious. I’m ready to work.